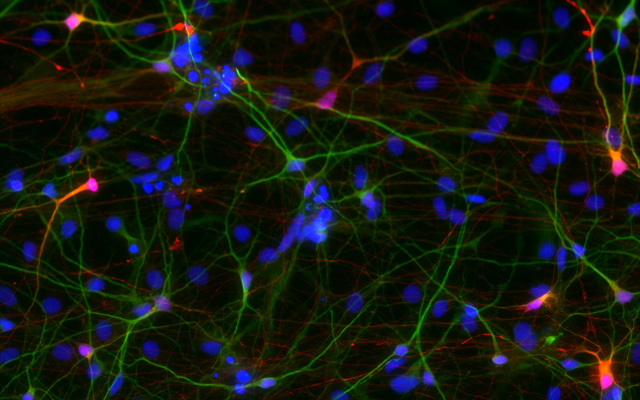 This image shows induced pluripotent stem cell-derived neural progenitor cells after neuronal differentiation. The neurons express a pan neuronal marker Map2 in green and a percentage of the cells express a marker for inhibitory neurons, GABA, in red. The cells’ nuclei are stained blue. The vast majority of cases of autism spectrum disorder (ASD) are idiopathic – the cause is unknown. In a paper published this month in the journal Molecular Psychiatry, researchers at the University of California San Diego School of Medicine, with colleagues across the nation and world, have created a “mini-brain” model, derived from persons with a particular form of idiopathic ASD characterized by over-sized brains, revealing a defective molecular pathway during brain development that results in early neuronal overgrowth and dysfunctional cortical networks. The characteristics and causes of ASD are diverse and not entirely known – facts that have made it difficult to fully uncover relevant genetic, pathologic and cellular factors that might be broadly shared. One distinct pathophysiology or disordered process is the occurrence of macrencephaly in some children with ASD, which is characterized by early neuronal overgrowth and abnormally enlarged brains. Macrencephaly occurs in the first three years of life and precedes the first clinical signs of ASD. Approximately 20 percent of ASD individuals have macrencephaly. Next, the researchers differentiated the progenitor cells into networks of cortical neurons, the primary functional cell type of the brain’s cortex (gray matter). “We showed that ASD networks fail to produce inhibitory neurons and found that several receptors and neurotransmitters related to GABA (an amino acid that acts as a neurotransmitter) are misregulated on these neurons. We also showed that the number of excitatory synapses is reduced, leading to functional defects when we analyzed the maturation of neuronal networks over time. Basically, we detected a lack of burst synchronization (when multiple neurons fire simultaneously). Muotri said the findings show it is possible to more effectively stratify ASD individuals for clinical trials by identifying persons who are likely to be more responsive to specific therapies using their “mini-brains” in a dish. Co-authors include: M.C. Marchetto, K.C. Vadodaria, A.P.D. Mendes, H. Ghosh, R. Wright and F.H. Gage, Salk Institute for Biological Studies; H. Belinson, UC San Francisco; Y. Tian, J. Ou and D.H. Geschwind UCLA; B.C. Freitas and C.A. Trujillo, UC San Diego and Rady Children’s Hospital-San Diego; C. Fu, Case Western Reserve University; P.C. Beltrao-Braga, UC San Diego, Rady Children’s Hospital-San Diego and University of Sao Paolo, Brazil; K. Padnanabhan, University of Rochester School of Medicine and Dentistry, NY; Y. Nunez, Salk Institute, UC San Diego and Rady Children’s Hospital-San Diego; K.J. Brennand, Icahn School of Medicine at Mount Sinai, NY; K. Pierce, L. Eichenfield, T. Pramparo, L.T. Eyler, C.C. Barnes and E. Courchesne, UC San Diego; and A. Wynshaw-Boris, UC San Francisco and Case Western Reserve University. Funding for this research came, in part, from the California Institute for Regenerative Medicine, the National Institutes of Health (1-DP2-OD006495-01, R01 MH100175-01, U19MH107367) the International Rett Syndrome Foundation, NARSAD, Helmsley Trust, JPB Foundation, Engmann Foundation, CDMRP Autism Research Program and Autism Speaks.